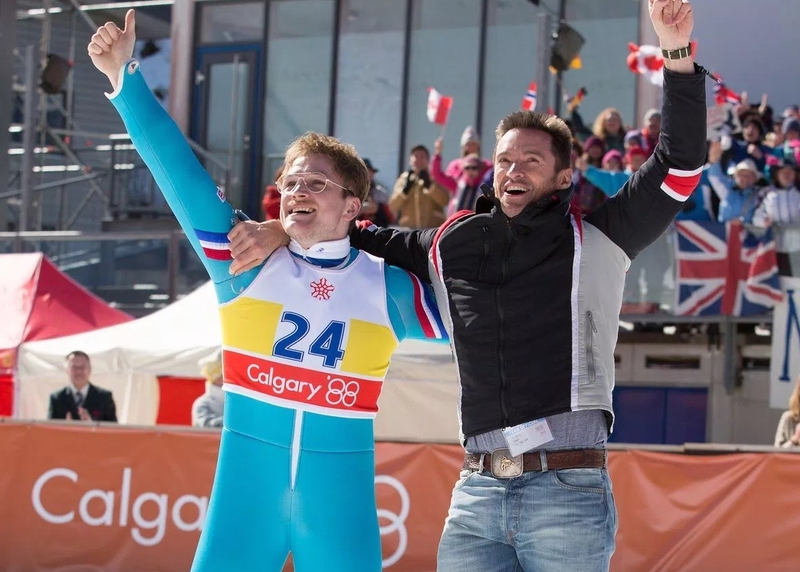 Dexter Fletcher's Eddie The Eagle is a mostly true re-telling of British ski jumper Eddie Edwards' unlikely rise to stardom at the 1988 Olympics in Calgary. Having only attempted ski jumping for little over a year before the games, Edwards was not in contention for any medals but still won over the crowd with his determination and enthusiasm. Kingsman: The Secret Service's Taron Egerton stars as Edwards, an awkward British 20-something who meets up with American ex-Olympian Bronson Perry (Hugh Jackman) and convinces him to be his coach. The story of Edwards' drive to be an Olympian is remarkable and very interesting to watch. We get to see all the loopholes that existed which allowed a relative novice of the sport make it to the biggest stage in the world. Thankfully Egerton and Jackman are perfectly cast for their roles and deliver a lot of laughs throughout that help liven up the story. Egerton in particular just nails everything about Edwards from his facial expressions to his mannerisms and constant "thumbs-up" gestures. Coming off a great star role in Kingsman, he's got a bright career ahead of him. Jackman plays off the younger Egerton easily and playing a cranky has-been drunk is not much of an acting stretch from Jackman's Wolverine role. Fletcher does a nice job of building tension and dread through most of Edwards' jumps. Everything looks very authentic too down to the uniform colors and the focus on Finnish ski-jumping legend Matti Nykänen. The fact that I've actually heard of and remember Matti will tell you how much I enjoy and remember past Olympic games. My biggest problem with the film is some of the effects are REALLY REALLY fake and noticeably bad. Watching a terribly generated CGI skier fall after attempting a jump really takes you out of the movie altogether. Some of the supporting cast (including a horny ski lodge owner) come off more as a nuisance as well, but the parents of Edwards were perfectly cast and the reunion of Mother/Father and son at the airport at the end of the film is pretty powerful. Shouts to Christopher Walken for showing up in a very limited role as Perry's old coach. Eddie The Eagle is a solid sports movie that follows the traditional "never-give-up" narrative of most successful sports films. This movie would have been just mediocre if it wasn't for the chemistry of the two leads. I would probably normally give this 3.5 JRs but since I'm someone who remembered watching the events in Calgary in '88 I was a little more attached to the story. Egerton is going to be a star and Jackman can do no wrong. A fine 4 out of 5 JRs for the 2nd best movie of 2016 so-far. Pretty sure this won't be staying on my 2016 Top Ten when all is said and done but it's definitely something to go and see in the theater, ESPECIALLY if you're a fan of the Olympics.